Ed Sheeran Admires Taylor Swift's Dry Sense of Humor: "She's Like The Office"
Taylor Swift's a funny gal, and her pal Ed Sheeran likes that about her. 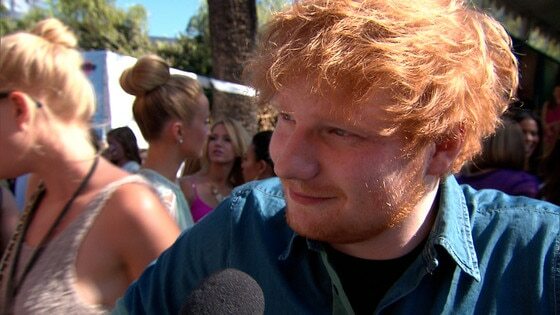 The English singer-songwriter caught up with E! News at the Teen Choice Awards yesterday, and told Jason Kennedy that his time in the U.S. has been memorable. "It's been fun. I've had a cool year. I spent nine months of in in America—well, eight months going on nine—it's been fun," he said. Sheeran's time in America was spent on the road as the opening act for T.Swift's Red tour, so clearly these two became close, which means Ed knows a thing or two about Taylor that the rest of the world may not know. Like her sense of humor, for example. Yes, we are all aware that Swift can crack a joke, but Sheeran explains that his road partner has "the most English sense of humor out of any American I've ever met." He clarified, "She's just dry, she has a very dry sense of humor and Americans are usually like slapstick comedy, that's the big thing but she's very English. She's like The Office. English Office, not Steve Carell—[Ricky] Gervais." Well, that's quite the compliment.